Improved comfort and safety for urban bicyclists who want to pedal more for everyday journeys is the vision of two UO research projects that are rolling forward as part of a $15 million federal grant. In announcing a five-year grant, the U.S. Department of Transportation designated Portland State University's Transportation Research and Education Center as the administrative home for a consortium called the National Institute for Transportation and Communities. With a multidisciplinary approach, UO researchers, led by Marc Schlossberg, co-director of the Sustainable Cities Initiative, will focus on how cities can redesign their streets to make bicycle transportation more accessible. The idea, he said, is to support economic development, reduce carbon impacts and expand transportation choices. This project will build on Schlossberg’s previous work, "Rethinking Streets," which sought to better integrate various forms of transportation, from pedestrians to public transit, without compromising vehicle traffic routes and safety. That work has been used by professionals, policymakers and community leaders in more than 20 countries. 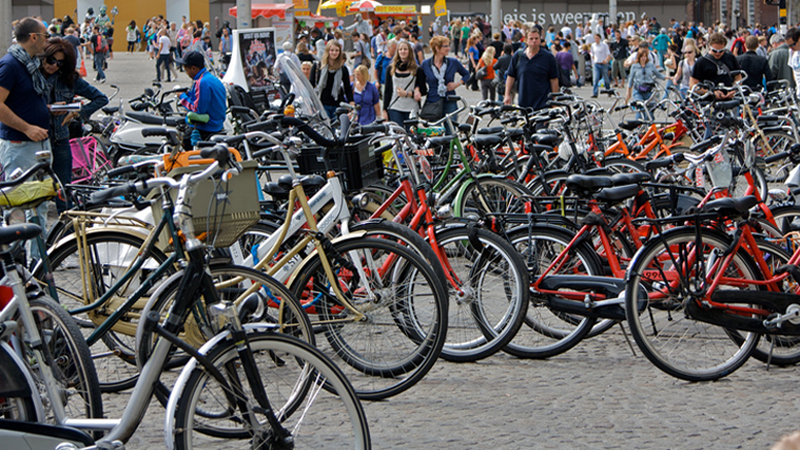 In the second project, UO computer scientist Stephen Fickas will seek to integrate bicycle transportation into a smart city framework — an emerging international movement to utilize various electronic devices, software and sensors to enhance the safety and flow of all transportation modes within urban areas. That framework has mostly focused on connected automobile technology. The effort led by Fickas, an affiliate of the Clark Honors College, will assure that sustainable, affordable and space-saving bicycle transportation continues to be part of the urban transportation mix. In the first year of the federal grant, 11 projects of the partner institutions, including those led by Schlossberg and Fickas, will move forward. Subsequent projects will be selected annually through a competitive application process. In addition to the UO and Portland State, the consortium's other members are the University of Utah, University of Arizona, University of Texas at Arlington and Oregon Institute of Technology. While many projects emerging from the UO will be related to the Sustainable Cities Initiative, it is not a requirement for proposals. Faculty members across campus can apply for funding from the new federal support, Schlossberg said. "Our primary strengths are that we address transportation issues in cities from many more disciplines than are typically included in transportation discourse, mirroring the complex nature of developing, implementing and understanding transportation systems in society," said Schlossberg, also a professor in the Department of Planning, Public Policy and Management. "Typically, such issues are addressed by transportation engineering or planning programs, but the UO has neither," he said. "Instead, we have faculty in planning, architecture, geography, law, business, computer science, landscape architecture, journalism, sociology, economics, public administration, product design and other disciplines that are interested in how our cities work and the role of transportation in making things work better." In the next five years, the National Institute for Transportation and Communities will focus on four research areas under the new grant: increasing access to opportunities; improving multimodal planning and shared use of infrastructure; advancing innovation and smart cities; and developing data, models and tools. Under the Fixing America’s Surface Transportation Act, the U.S. Department of Transportation received 212 applications for 35 grants creating five national centers, 10 regional centers and 20 lower-level centers. All grants require one-to-one matching funds, thereby leveraging federal money with investments from universities and partners in the private, nonprofit or other government sectors. In addition to research, the National Institute for Transportation and Communities will support students in more direct ways. The new grant will annually support $30,000 in scholarships for students who focus on transportation studies. If an annual matching contribution of $30,000 can be secured, Schlossberg said, the UO will then be able to recruit top graduate students who are interested in the multidisciplinary aspects of transportation and sustainability in cities. While such matching funds have yet to be identified, the Sustainable Cities Initiative is developing plans for a sustainable transportation scholars program. The new grant also will support LiveMove, a transportation and livability student group that has worked with local communities to explore how other cities are working to increase their quality of life and sustainability through their transportation systems. One of the key strengths of the UO’s approach to transportation research, Schlossberg said, is an emphasis on not only doing research, but advancing it in a translational way so what is learned may be applied to practices and policies. "More of the world’s population is now urban and that trend will continue, so getting our cities right is a local, national and international priority," he said.